The most advanced, reliable and most accurate HVAC refrigerant identifiers on the worldwide market. RefriApp distributes this technology and offers technical support to its customers. A decade of R&D and expertise, after years of continously evolving we’ve taken refrigerant identification to the next level and set the standard for performance, accuracy and portability. Thanks to Dispersive infrared (NDIR) technology, which determines the weight concentrations of refrigerants and provides a component breakdown of the blend ratios and air, Neutronics Refrigerant Analysis designs and manufactures advanced refrigerant analysis instruments for automotive and HVAC/R professionals around the globe. Our state-of-the-art refrigerant identifiers and A/C sealant detection kits are used to prevent refrigerant contamination and avoid damage to costly A/C service and handling equipment. 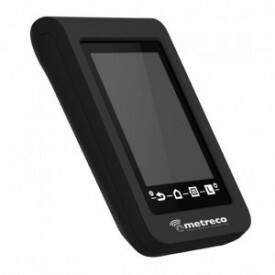 Its ergonomic design and exceptionally portable design make it easy and profitable to use. 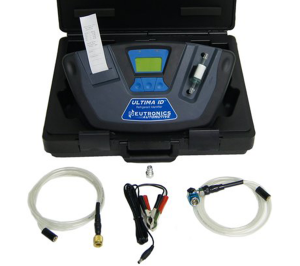 Diagnostic refrigerant analyzer for multiple HVAC and refrigeration applications. This technology determines, quickly and accurately, the weight concentrations of refrigerants and provides a component breakdown of the blend ratios and air.“Blend-ID” analytical software quickly and accurately indicates the presence of blend refrigerants. It includes on-board printer. Weight: less than 10 lb. Refrigerant detected: R22, R134a, R404A, R407C, R410A, HCs, many more. 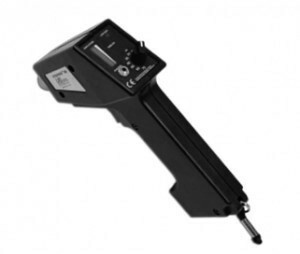 Accuray: +/-2% of indicated gasses or better. Power requirements: 12V DC @ 2A via 110/220V AC Adapter; optional rechargable powerpack. Approvals: CE, UL and CUL. User interface: Graphic display, soft keys, built in printer. Sample gas extraction: pressure from cylinder or system. Temperature range: 50 to 110ºF. Response time: less than 3 min. Test sample size: 5g per test. Test pressure: 50 to 500 psi. 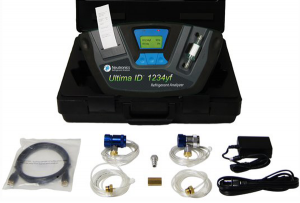 Refrigerant Analyzer will provide a fast, easy and accurate means to determine R1234yf and R134a refrigerant purity in refrigerant storage cylinders or directly in vehicle air conditioning systems. Identifies illegal replacements and blends including propane and butane. Refrigerant detected: R1234yf, R134a, R22, HCs and Air. Power requirements: 12-15V DC, Battery pack (internal). Approvals: UL, CE, SAE J2912. Output: digital display and LEDs, printer module (internal). Display: 128 x 64 pixel graphing. Interfaz: USB (SAE J2843 RoHS). Operating humidity: 0-95% RH non-condensing. Operating temperature: 50ºF to 120ºF. The instrument is supplied complete with a built in printer*, R1234yf sample hose, R134a sample hose, an AC power supply, tank adapters for both R1234yf and R134a, an internal rechargeable battery and all required plumbing housed within a rugged, portable, storage case. *Model RI-2012YF: on-board printer not included. 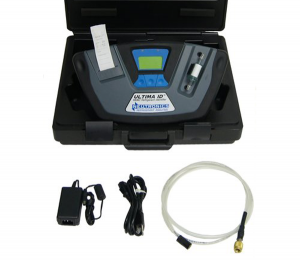 Easily and quickly this Refrigerant Analyzer indicates what percentage R12, R134a, R22, hydrocarbons like R660, 290 and also R410A are present in the sample taken. Refrigerant detected: R12, R134a, R22, R410A and HCs. Power supply: 110 – 200V AC, but as an option a battery power pack is available. Output: LCD screen, printer module (internal). The instrument is supplied complete with a built in printer*, an AC adapter, a 1/4″ flare sample hose, a 110/220 AC adapter and all required plumbing housed within a rugged portable case. *Model RI-2004HV: on-board printer not included. Ergonomically designed refrigerant analyzer, quickly, easily and accurately, determines the weight concentrations of refrigerant types R12, R134a, R22, Hydrocarbons and air. 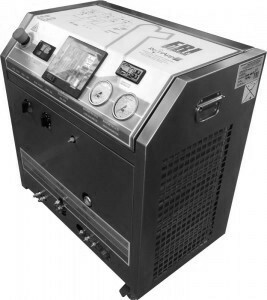 In addition, identifies illegal replacements and blends including propane and butane. Refrigerant detected: R12, R134a, R22, HCs and EP SNAP approved blend refrigerants. Power supply: 12-15VDC, battery pack (internal). Operating temperature: 40ºF to 130ºF. 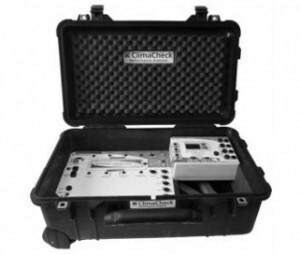 The instrument is supplied complete with a built in printer*, 12Vdc from the vehicles battery, R12 and R134a sample hoses, an R134a adapter fitting, 12Vdc battery clips and all required plumbing housed within a rugged portable case. *Model RI-2012DX: on-board printer not included. That instrument helps you verify the presence and quality of R22 refrigerant in HVAC/R air conditioning systems, so it can help avoid potential damage to your air conditioning service equipment and business from refrigerant contamination. 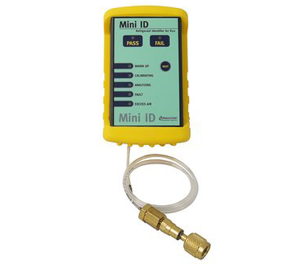 The Mini ID delivers fast and accurate refrigerant analysis in a self-contained, compact, and extremely portable package. The unit is rugged and very simple to use. 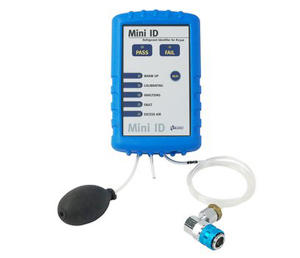 It automatically provides step-by-step indication of the gas sampling process. Power requirements: 9V battery (Optional 110/220V AC). User interface: membrane type with visual indicators. Calibration method: electric internal pump. Storage temp. : +10ºC to +50ºC. Operating temp. : +10ºC to +45ºC. Construction material: molded ABS housing / molded rubber sleeve. The new, low cost Neutronics Mini ID Refrigerant Identifier for R134a helps you verify the presence and quality of R134a refrigerant in Automotive air conditioning systems. 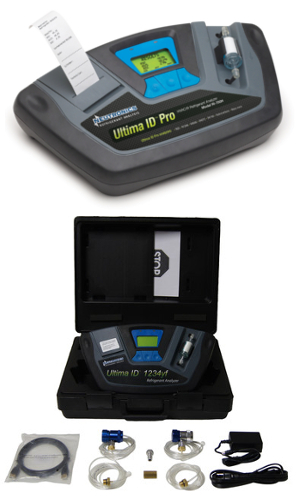 The Mini ID delivers fast and accurate refrigerant analysis in a self-contained, compact, and extremely portable package. The unit is rugged and very simple to use. 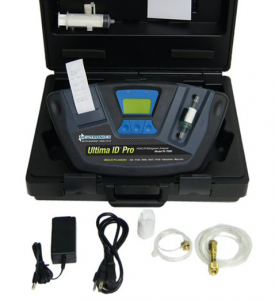 It automatically provides step-by-step indication of the gas sampling process. Power requirements: 12 V DC via incluced battery clips. Approvals: UL, CE, SAE J1771. Storage temp. : -10ºC to +50ºC. Operating temp. : +10ºC to + 45ºC. Construction material: molded ABS housing/ molded rubber sleeve. Meet our prices and financing facilities. For more information visit the Neutronics website.